Nothing gets me in the holiday groove better than being around my kids. Their excitement is like a low level vibration that can be felt all through the house. Well, sometimes it’s not so low level. Now that the advent calendar is in use, it’s all about counting the days. We’ve been making ornaments like crazed little elves. These pipe cleaner ones were inspired by the ones in Family Fun magazine. (I know nobody cleans pipes with them any more, but I refuse to call them “chenille stems”.) These are super easy for kids to thread beads on to. These felty ornaments the boys made as teacher gifts. I saw the button snowmen somewhere online (sorry!) and the trees and penguin evolved from there. 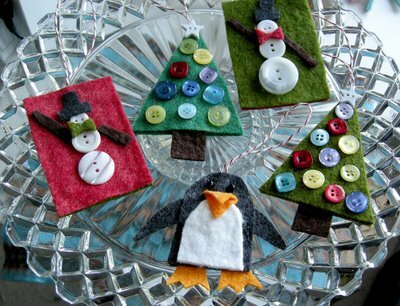 Today the That Artist Woman (found via the Crafty Crow) had little felt skate ornaments I’d like to try with the kids next! Who’s that little gingerbread man you ask? Why he’s That 70’s Plastic-ginger-dude from my childhood. Maybe I’ll knock him off. Y’know…in felt. 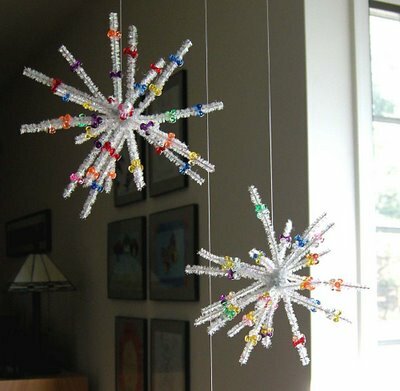 What fun things to make with your children! What cute little projects.I esepceillay love the gingerbread man.He has such a nice expression. Oh, I love the snowflakes! They look easy, yet fun! Thanks for sharing – I think we’ll be making some of these! Que cosas hermosas, te felicito. So much cuteness! How fun-thanks for the ideas! What fun! I can’t think of a better way to spend the day. What magical memories you and your children are creating. I figure that’s no more confusing to my kids than “chenille stems”. Thank you for the great idea for simple ornaments! I am not able to say which thing is the most beatiful!!! I love every piece of these works!!! It’s lovely to see Christmas’ air everywhere! I love the pipe cleaners decorations. So pretty and something my four year old daughter would love to do!! Thanks for the post. I actually own the felt skates but mine are way more cute because they are stuffed. Make yours that way too! They were a gift from a relative in Florida, bought from a local craft show. Um…what DO people clean pipes with these days? These ornaments are adorable – I especially like the button ornaments on the tree ornaments! 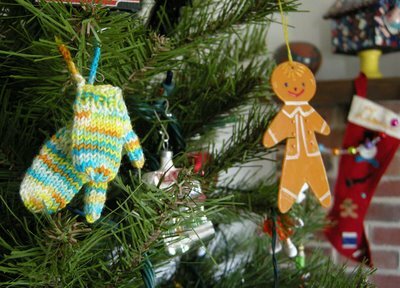 Those mitten ornaments are adorable!! I’ve seen the button snowman in a Martha Stewart magazine. So many great ideas in this post. Felt is so great for children to work with. I love the little knitted mittens. I spent the day with a chocolate bar and white yarn, crocheting a star garland that I’m hoping to put up a pattern and tutorial for. Gingerbread man would look great in felt. Congrats on your Craft cover – recognised you straight away from your blog! Ack! We had the gingerbread man on our tree when I was little! Though I think he’s from the late 50’s early 60’s. He had an angel friend, too, with really pointy toes.